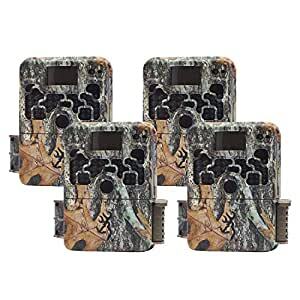 The Browning Strike Force HD 850 Camera comes with a 16 MP camera that captures 1280 x 720 HD video with sound. With lightning fast 0.4-second trigger speeds, the camera is also capable of capturing up to 8 images in Multi-Shot mode and 8 in Rapid Fire mode ensuring that you don’t miss the action. The Strike Force HD camera also takes night pictures using Zero Blur technology which eliminates motion blur from the game in your pictures at a range of 100 feet at night. The camera features Timelapse Plus shooting mode that captures images at pre-set intervals over a designated period of time and is stored on a user-supplied SDXC card up to 512GB. The Strike Force Camera runs on 6 AA batteries, which are available separately, or on an optional external power supply connected to its 12V power jack.